Cuba Mission Trip - 400+ Trusted Christ! 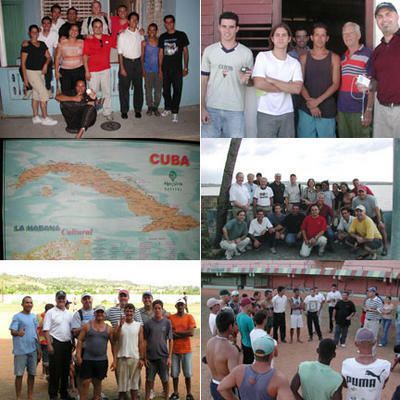 I went to Cuba with a group of 12 business men to do lots of personal evangelism. We partnered with a Cuban church and translators to go door to door explaining how they could come to know Christ. It was unbelievable! As you probably know, Cuba's communist government is against organized religion and is not very friendly to Americans. Once I was even interigated by police officials when out sharing our faith. The openness of the Cuban people was a breath of fresh air. Our schedule was simple: eat breakfast, go out with your translator to 4-6 homes to share the gospel, come back for lunch, go out again to 4-6 more homes to share the gospel, come back for dinner, and share with teammates of the miraclous stories of new Believers that came to Christ that day! The next days were basically the same. In total we saw over 400 Cubans begin a new relationship with the God they've been restricted from hearing about for years. The church is now following up these new contacts. Please pray for their discipleship and for the pastor's wife (28 years old) who is recovering from brain surgery.